Agropyron cristatum subsp. pectinatum (L.) Gaertn. Perennial, tufted grass from fibrous roots; stems (30) 50-100 cm tall, usually soft-hairy below the spike. Sheaths open, the lower ones smooth to somewhat long-hairy or soft-hairy; blades soft-hairy on the upper surfaces, flat, 1.5-5 (10) mm wide; ear-shaped lobes at the leaf-bases slender, about 1 mm long; ligules fringed with fine hairs, scarcely 1 mm long. Inflorescence a dense, oblong, flattened spike, 1.5-5 (13) cm long, the rachis rough short-hairy; spikelets closely overlapping, less than 1 mm apart, spreading at an angle of 30degree or more to the rachis, mostly 5- to 7- (8-) flowered, (5) 7-12 (15) mm long, separated by short rachis internodes (0.7) 1-1.9 (2.3) mm long; glumes short-awned, the awns gradually tapering, 2-4 mm long; lemmas short-awned, the awns sometimes slightly bent, 2-4 mm long. The three Agropyron species occurring in BC hybridize readily when growing together, forming morphologically intermediate plants. In addition, some cultivars are also intermediate, being derived from hybrids. 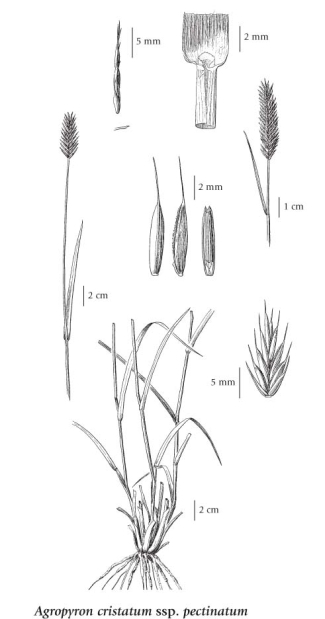 Consequently, identification of Agropyron species in North America is often extremely difficult. In many instances, it may be best to refer to plants of this genus as A. cristatum sens. lat., the last phrase indicating no distinction is being made between the three species. Dry to mesic roadsides, fields and waste places in the lowland, steppe and montane zones; frequent in SC and SE BC, rare in SW BC; introduced from Eurasia. Agropyron imbricatum Roem. & Schult. Agropyron pectinatum (M. Bieb.) P. Beauv.